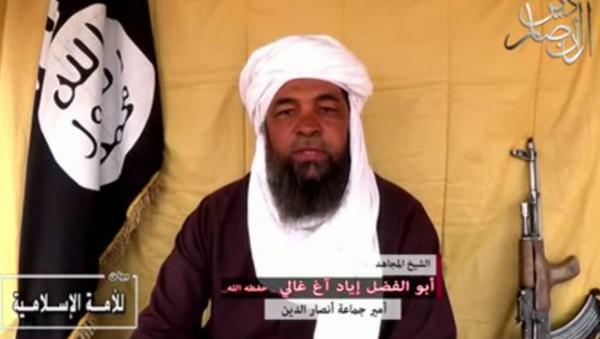 Iyad Ag Ghaly, the Malian Tuareg leader of Ansar Dine, has resurfaced with the release of an audio statement in which he threatens France and rejects any peace deal in Mali. The audio was published by al Qaeda in the Islamic Maghreb (AQIM), which has close ties to Ansar Dine, on one of its official Twitter feeds. Ghaly also sends his “distinguished greetings” to the mujahideen in “Sikasso, Macina, Sevare, Giwanzer, Timbuktu, Kidal, and others from the frontlines of jihad and martyrdom.” Sikasso and Macina, which are in southern Mali, were the scenes of two attacks conducted by Ansar Dine earlier this year. The attacks in southern and central Mali undertaken by the jihadist group were likely executed by its Fulani front, the Macina Liberation Movement. The mention of Sevare is a reference to the hotel siege perpetrated by the jihadist group Al Murabitoon, which is openly loyal to al Qaeda, in early August. Ghaly has had a long history of rebellion in Mali. Before being radicalized, he led a Tuareg rebellion against the government in 1990. In late 2011, Ghaly formed the jihadist group Ansar Dine. During the Tuareg rebellion in 2012, Ansar Dine worked alongside AQIM, the Movement for Oneness and Jihad in West Africa (MUJAO), and Tuareg groups to take over the country’s north. The three jihadist groups then quickly pushed the Tuaregs out of the areas that they controlled. AQIM views Ansar Dine as its local arm in Mali; in a “confidential letter” from Abdelmalek Droukdel, the emir of AQIM, that was found in Timbuktu in early 2013, he instructed his followers to mask their operations and “pretend to be a ‘domestic’ movement” under Ansar Dine so as not to draw international attention and intervention. However, the jihadists’ heavy-handed tactics and violence prompted the French to intervene to help the Malian government take back the north. On Feb. 26, 2013, both the United States and the United Nations added Ghaly to their lists of Specially Designated Global Terrorists. The State Departmented noted that he “cooperates closely with al Qaeda in the Islamic Maghreb.” [See LWJ report, Emir of Ansar Dine added to US, UN’s terrorist lists.] Ansar Dine itself was identified as a terrorist organization by the US and the UN in March 2013. Despite the French intervention and the current French-led counterterrorism mission in the region, al Qaeda and its many affiliates in Mali continue to operate. These groups retain the ability to mount rocket, mortar, and IED attacks on UN and French forces. Over 50 UN peacekeepers have been killed in Mali since 2013, making it the most dangerous UN mission in the world. For information on al Qaeda-linked attacks in Mali and neighboring countries since 2014, see this map created by The Long War Journal.